Keyfactor, a leading provider of secure digital identity management solutions, will showcase its vision and solutions for connected healthcare at the HIMSS19 Global Conference & Exhibition at the Orange County Convention and Exhibition Center in Orlando, FL, from February 11-15, 2019. Keyfactor will exhibit at booth #7465, as well as kiosk 400-71 in the Cybersecurity Command Center. 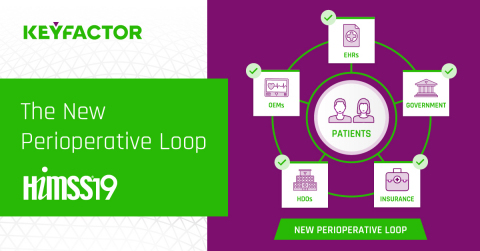 Additionally, Keyfactor CEO and Co-Founder Kevin von Keyserling will present Insights for Securing the Perioperative Loop in Cybersecurity Theater A on Wednesday, February 13, starting at 2:45 pm ET. As the definition and delivery of healthcare continues to evolve, a swift convergence of medical advances, emerging technologies, consumer choices and expectations is accelerating change. No longer confined by the walls and location of a hospital or doctor’s office, traditional borders and guardrails are dissolving – and doctors, nurses, medical technicians and others are caring for patients face-to-face and from afar. This expanding and virtual healthcare drives better outcomes – but achieving secure digital interoperability within this ecosystem is challenging. Healthcare organizations and medical device manufacturers make up approximately 20% of Keyfactor's customer roster, with more than half of those organizations ranking in the Fortune 1000. This includes publicly traded pharmaceutical companies, leading connected device manufacturers and large, internationally renowned hospital systems. For more information about Keyfactor products and services visit us at Booth #7465 or www.keyfactor.com, and follow us @Keyfactor on Twitter. Keyfactor, formerly Certified Security Solutions (CSS), is a leading provider of secure digital identity management solutions that enable organizations to confirm authenticity and ensure the right things are interacting in the right ways in our connected world. From an enterprise managing millions of devices and applications that affect people’s lives every day to a manufacturer aiming to ensure its product will function safely throughout its lifecycle, Keyfactor empowers global enterprises with the freedom to master every digital identity. Its clients are the most innovative brands in industries where trust and reliability matter most.